Come join the voices of the Peoria Area Civic Chorale! Our auditioned chorale is 70 singers strong with room to grow. 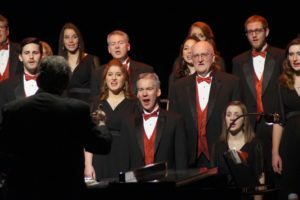 If you love to sing and have some choral experience, a good sense of pitch, and read music… then consider singing with the Peoria Area Civic Chorale. Singers come from all walks of life, united by their passion for choral music excellence and their devotion to community cultural service. Participation in the Chorale allows vocal musicians to give back to their community while improving their musicianship. 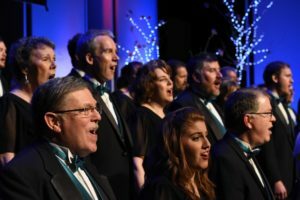 The financial commitment for participating in the Chorale for a new member includes a tax-deductible $50 assessment per semester and the purchase of a dress or tuxedo which would be less than $100. Any singer who desires to join the Chorale must audition with our Artistic Director and Conductor Dr. Joseph Henry. Auditions are traditionally held twice per year in advance of each new concert. Please see below for current audition dates. We are always looking for new singers to join our group! Individual appointments can be scheduled at other times during the season, at the convenience of the director and depending on the Chorale’s rehearsal workload. Interested singers are encouraged to call or email the Chorale for more information or to schedule an appointment. See our PACC Recruitment Brochure for additional information. Formal auditions for our An American Family Christmas concert, which will be performed December 13-15, will be held on Tuesday, August 13 at St. Paul’s Episcopal Church (3601 North North Street, Peoria, IL). Auditions for the spring 2020 concert, which will be performed May 8 & 9, will be held Tuesday, January 14 also at St. Paul’s. To schedule an audition, please contact the PACC business office at pacchorale@gmail.com or call 309-693-6725. If you are unable to make an audition date, auditions may also be scheduled directly with Dr. Joseph Henry. Please contact him at jdhenrydma91@gmail.com or call 309-635-2653 and include your name, phone number, voice part(s) and both email and mailing addresses. All voice parts are welcome. Rehearsals will take place Tuesday evenings from 7:00-9:00 pm at St. Paul’s Episcopal Church and commence on August 20, 2019 and January 21, 2020. To download an Audition form to bring to the auditions, click here. 2. Please provide two copies of your audition song. A piano accompanist will be provided. 3. Additional vocalization and tonal memory exercises may be added at the director’s discretion. The audition process is given in the positive spirit of the Civic Chorale. So, please enter the audition with eagerness and confidence, and sing to your fullest potential. We wish you the very best! Peoria Area Civic Chorale Affiliated Outreach Hymn Choir! Click to learn more about our Outreach Hymn Choir.